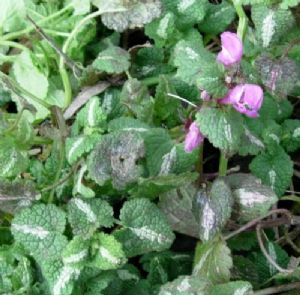 similar to the wild red dead nettle, but this plant has a silvery white stripe down the centre line of each leaf. Like the other dead nettles it is so called because it does not sting, and the flowers are valuable to bees for nectar and pollen in early spring. the plant spreads to form an attractive groundcover that is, however, easily pulled out to control if needed.